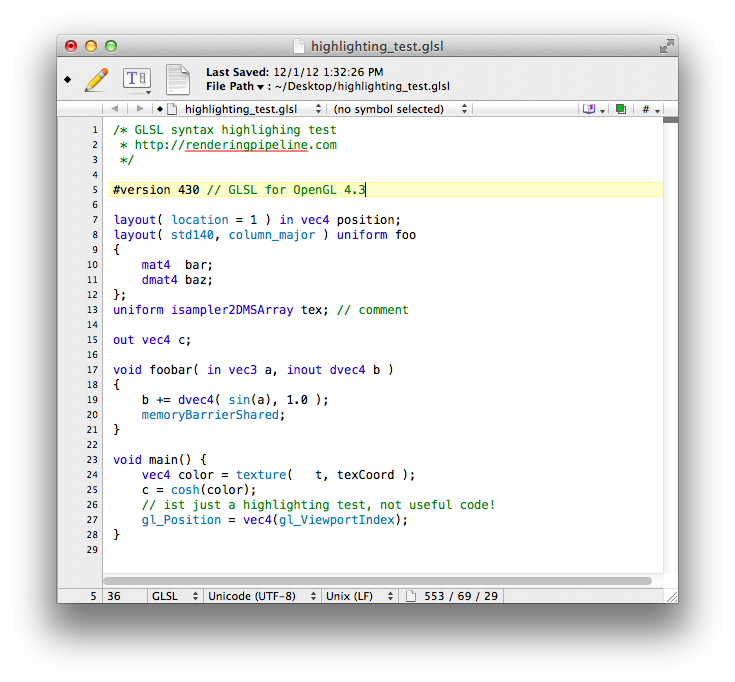 I hacked together a very simple codeless language module for TextWrangler (also compatible with BBEdit) for GLSL shaders. It is much simpler than the Kate/QTCreator highlighting and only highlights GLSL version 430 (core profile) but it’s better than nothing (In case you are writing shaders for OpenGL ES 3.0, or OpenGL 3.0 – 4.2 it just means that reserved keywords are highlighted as well. In case your shaders are WebGL, OpenGL ES 2.0 or OpenGL 2.x, some (now deprecated) keywords won’t get highlighted). To install it, download the glsl430.plist (unzip it) and drop it into your ~/Library/Application Support/TextWrangler/Language Modules folder. After restarting TextWrangler, all .glsl .fsh .vsh .gsh .tcsh .tesh .csh .frag .vert and .geo files should get the correct highlighting. In case you prefer other extensions, you can add or remove extensions from the beginning of the plist (just edit it in a text editor) or change the settings in TextWrangler under Preferences->Languages->Custom Extension Mappings.